Scientists undertook a groundbreaking large-scale study on secondary glioblastomas (sGBM). sGBMs are an aggressive type of brain tumor, target younger patients and existing treatment method is insufficient. sGBM is a rare type of brain cancer in adults. The incidence varies from 2 to 5 per million people per year. For example, if Hong Kong's base population of 7.5 million people is taken as a reference, over 15 people will be diagnosed with sGBM tumors annually. sGBM starts off as low-grade glioma (LGG) tumors around nerve cells that surround the spine and brain, and its 5-year survival rate is under 10%. Currently, sGBM tumors are treated with a chemotherapy drug called temozolomide (TMZ), first developed in Europe and became available for widespread patient use in the early 2000s. TMZ invokes non-specific DNA damage to tumor cells to prevent it from reproducing and spreading. However, history and patient data show that sGBM patients undergoing TMZ treatment almost invariably have relapses which display mutations that allow the sGBM tumors to evade a second round of TMZ treatment, making it chemo-resistant and pushing researchers to look further afield to seek better treatment options. For the first time, this study revealed the somatic mutational landscape of sGBM in 188 cases and showed that a significant proportion (approximately 14%) of sGBM patients displayed a new mutation, METex14 (some of those simultaneously harbor another mutation, named ZM fusion), which led to more aggressive tumor growth. Previous studies were much smaller (typically 20 patients or less) and therefore meant that findings were inconclusive. 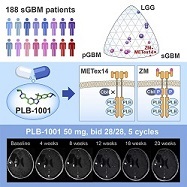 Promisingly, a MET kinase inhibitor molecule named PLB-1001 was identified and is able to penetrate the blood-brain barrier, a key treatment characteristic. This new molecule shows remarkable potency in selectively targeting sGBM tumors and sGBM tumors that co-display this mutation. Ultimately, this finding offers a new silver lining for both medical researchers and sGBM patients alike and will continue to shed more light on how to better treat this aggressive tumor type. Illustration: Graphical abstract. Cell, 2018.